What Harm Could Exotic Bumblebees Do in Australia? European bumblebees (Bombus terrestris ssp audax) were accidentally introduced into Tasmania in 1992 and since then these feral bumblebees have invaded most of that island . If these bumblebees were introduced to mainland Australia for crop pollination or slipped accidentally though our quarantine systems, another feral invasion would begin. In mainland Australia, feral bumblebees could spread from South Australia to southern Queensland and through parts of Western Australia, invading our farms, our bushland and our urban backyards. What harm could these exotic bumblebees do? Wouldn't Feral Bumblebees be Useful to Crop Growers? Bumblebees could cause serious problems by spreading weeds such as white horsenettle, buffalo burr, foxgloves, blackberry, broom, Paterson's curse, gorse, impatiens, agapanthus, buddleia and rhododendrons. Bumblebees are specialised pollinators of many agricultural weeds in the genus Solanum, including white horsenettle and buffalo burr. Some Solanum weeds are poisonous to livestock and children have died overseas after eating the fruit of buffalo burr . Bumblebees are specialised pollinators of foxgloves too. In New Zealand where bumblebees were introduced in the 1800s, the foxglove is an abundant weed in disturbed soil and roadsides . In NSW which is currently bumblebee-free, foxgloves are naturalised in some areas but they have not yet become abundant, probably due to limited seed production. Bumblebees are also the major pollinators of impatiens, an invasive weed of riverbanks and lakesides in Europe, Britain, North America and New Zealand where it often grows so densely that it smothers other plants [3, 4, 5, 29, 31, 34, 36, 37, 38, 39]. Weed populations of agapanthus, buddleia and rhododendron in Tasmania also appear to have become more invasive since the arrival of feral bumblebees . In the absence of bumblebees on the Australian mainland, some of these weeds are now acting as relatively benign 'sleeper weeds'. However, if bumblebees became feral and spread through the Australian mainland, some of these weeds could become much more invasive and destructive new pests . Exotic weeds already cost Australia at least $4 billion per year in control and lost production. Goulson (2003) points out , 'If even one new major weed occurs in Australia due to the presence of bumblebees, the economic and environmental costs could be substantial'. Bumblebees could compete with commercial honeybees for the nectar of leatherwood, eucalypts, banksia and other flowers because bumblebees can fly and forage at lower temperatures than honeybees can [16, 18]. Bumblebees can also carry pathogens that affect honeybees, such as deformed wing virus, American foulbrood and chalkbrood. Even bumblebee colonies that have been certified as 'disease-free' may carry these pathogens . Our commercial honeybees could be at risk, particularly if further bumblebee stocks were introduced to Australia to improve the existing feral population for commercial use. Dr Andrew Hingston found that the feral bumblebees in Tasmania had spread in one decade into all of this island's major vegetation types and are found from sea level up to 1260m above sea level. They have become established in the most remote areas of Tasmania, including in four out of five national parks in the Tasmanian Wilderness World Heritage Area . Further surveys have shown that bumblebees are breeding in native vegetation in every region of Tasmania and active nests were found in National Parks . One colony in Maria Island National Park, isolated from urban areas by 10 km of sea, had produced at least 304 new queen bees . -- Bumblebees store food in their nests , while solitary bees do not, so they can better survive periods of food shortage. -- Bumblebees can fly at least 4 km from their nests, while many solitary bees can only fly a few hundred metres , so they have a better chance of finding good food sources. -- Bumblebees can learn from their hundreds of nest mates about the discovery and scent of good food sources , while solitary bees must find all their food by themselves by trial and error. -- Bumblebees can fly at much lower temperatures than most native bees, so they are able to forage much earlier in the morning . In situations where nectar and pollen are in short supply, bumblebees may exhaust the available supplies before the native bees begin to fly. Native bees in the family Colletidae are the most likely to suffer competition from bumblebees because the flowers preferred by the Colletidae native bees are visited particularly heavily by bumblebees . About half of Australia's native bees belong to the family Colletidae . The use of nectar and pollen resources by bumblebees could also disadvantage birds such as honeyeaters and parrots. Australian honeyeaters may increase their territory sizes and displace subordinate birds , lose weight [11, 27] and suffer increased mortality  when nectar supplies are reduced. Of special concern is the endangered Swift Parrot, Lathamus discolor. Fewer than 2500 Swift Parrot adults remain in the wild. They are dependent largely on the nectar and pollen of Eucalyptus globulus and E. ovata for food while breeding. In Tasmania Andrew Hingston found that these flowers were virtually devoid of nectar when the introduced European honeybees and bumblebees were active. Because honeybees do not forage in large numbers at temperatures below 15°C, early mornings and cold days have provided a window of opportunity for Swift Parrots when they did not have to compete with honeybees. However, the recent introduction of bumblebees appears to be closing this window because they are able to forage at much lower temperatures than honeybees . A study of the feral bumblebees in Tasmania  showed that bumblebees were visiting at least 66 native species of plants from 21 families. Bumblebees were established in a variety of vegetation types from coastal heath, through sclerophyll forest, and alpine shrubberies up to an altitude of 1100m. This shows there is potential for these exotic bumblebees to harm a wide variety of Australian native plants. Bumblebees also were foraging on some plant species that are not visited by European honeybees --- plant species previously free from the effects of exotic bees. -- Exotic bees may increase seed production by providing additional pollination services. -- They may reduce seed production by removing pollen from flowers. -- They may reduce seed production by displacing native pollinators without properly pollinating the flowers themselves. Much more research needs to be done. However, early studies in Tasmania have already shown that bumblebees may be affecting native plant seed production by robbing nectar from the native Common Heath (Epacris impressa) and displacing native megachilid bees from Gompholobium flowers [19, 20]. Bumblebees defend their nests aggressively if provoked and can sting repeatedly. Normal reactions to stings include pain and swelling; but allergic people may also suffer itching, nausea, vomiting, defaecation, difficulty in breathing, low blood pressure and loss of consciousness [7, 9, 23, 35]. Fortunately, severe allergic reactions to stings are rare. However, bumblebees can be stirred up by perfume, aftershave, lawnmowers and inquisitive dogs. Bumblebees would be a most unwelcome addition to the gardens and children's playgrounds of our mainland cities. Wouldn't Feral Bumblebees be Useful to Crop Growers in Australia? Australian horticulturalists are keen to import bumblebees for crop pollination. However, a feral population that started from just one or two bees, entering the Australian mainland accidentally or through smuggling, would be of almost no value to crop growers. Whether the founding queen bee came from New Zealand or Tasmania, the resulting population would be extremely inbred and would not be commercially viable. All the feral bumblebees in Tasmania probably descended from just one or two fertilised queens, so they are highly inbred [2, 32]. Buttermore and colleagues concluded that the commercial use of these bees would not be practical. They also found that in 50% of Tasmanian nests, abnormal male bees replace half of the female foragers. Males make no contribution to pollination of tomatoes as males forage only for nectar, and tomatoes produce no nectar. So these inbred Tasmanian nests do not produce enough foragers to efficiently pollinate greenhouse tomatoes. In addition, bumblebee queens only mate once and those that mate with the abnormal males do not produce any viable offspring. So a feral population of bumblebees on the Australian mainland that started from the accidental or deliberate introduction of just one or two bees would be virtually useless to crop growers, especially if these bees came from the inbred population in Tasmania. It would not be possible to breed them in a cost effective way and at least half of the nests would not have enough foragers to be used commercially for crop pollination. Note: Would-be smugglers should also remember that illegal importation of bumblebees to the Australian mainland could also attract fines of up to $5.5 million! Aussie Bee acknowledges the contributions of Dr Andrew Hingston of the University of Tasmania to the material in this article. The European bumblebee, Bombus terrestris, is listed as a Key Threatening Process by the NSW Government. 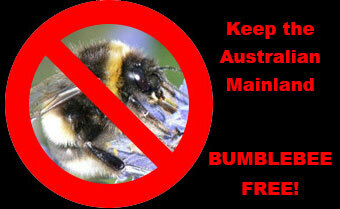 The European bumblebee is also listed as a Potentially Threatening Process by the Victorian Government. -- In Victoria, phone 136 186. -- In New South Wales, phone 1800 084 881. -- In Queensland, phone 13 25 23. 1. BUTTERMORE, R E (1997) Observations of successful Bombus terrestris (L.) (Hymenoptera: Apidae) colonies in southern Tasmania. Australian Journal of Entomology 36: 251-254. 2. BUTTERMORE, R E; POMEROY, N; HOBSON, W; STEMMENS, T; HART, R (1998) Assessment of the genetic base of Tasmanian bumble bees (Bombus terrestris) for development as pollination agents. Journal of Apicultural Research 37: 23-25. 3. BEERLING, D J; and PERRINS, J M (1993) Impatiens glandulifera Royle (Impatiens roylei Walp.). Journal of Ecology 81, 367-382. 4. CHITTKA, L; SCHURKENS, S (2001) Successful invasion of a floral market. Nature 411, 653. 6. DAFNI, A, KEVAN, P, GROSS, CL, GOKA K (2010) Bombus terrestris, pollinator, invasive and pest: an assessment of problems associated with its widespread introductions for commercial purposes. Applied Entomology and Zoology, 45: 101–113. 7. 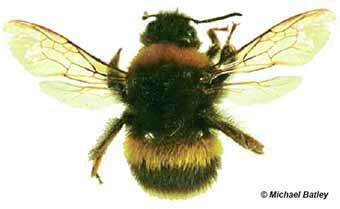 DE GROOT, H; DE GRAAF-IN 'T VELD, C; GERTH VAN WIJK, R (1995) Allergy to bumblebee venom I. Occupational anaphylaxis to bumblebee venom: diagnosis and treatment. Allergy 50: 581-584. 9. DONOVAN, B J (1978) Anaphylactic shock and strong cardiac stimulation caused by stings of the bumble bee Bombus terrestris (Hymenoptera; Apidae). The New Zealand Entomologist 6: 385-389. 10. DORNHOUSE, A; CHITTKA, L (2004) Information flow and regulation of foraging activity in bumble bees (Bombus spp.). Apidologie 35: 183-192. 11. FORD, H A; PURSEY, J F (1982) Status and feeding of the eastern spinebill Acanthorhynchus tenuirostris at New England National Park, north-eastern NSW. Emu 82, 203-211. 12. GOULSON, D (2003) Effects of introduced bees on native ecosystems. Annual Review of Ecology, Evolution and Systematics 34, 1-26. 13. GRAYSTOCK, P; YATES, K; EVISTON, SEF; DARVILL, B; GOULSON, D; HUGHES, WOH (2013) The Trojan hives: pollinator pathogens, imported and distributed in bumblebee colonies. Journal of Applied Ecology 50, 1207-1213. 14. HINGSTON, A B (2006) Is the exotic bumblebee, Bombus terrestris (Apidae), really invading Tasmanian native vegetation? Journal of Insect Conservation 10, 289-293. 15. HINGSTON, AB (2006b) Is the introduced Bumblebee (Bombus terrestris) assisting the naturalization of Agapanthus praecox ssp. orientalis in Tasmania? Ecological Management and Restoration 7, 236-238. 16. HINGSTON, AB (2007b) The potential impact of the Large Earth Bumblebee Bombus terrestris (Apidae) on the Australian mainland: lessons from Tasmania. The Victorian Naturalist 124: 110–117. 17. HINGSTON, A B; MALLICK, S A (2003) Are introduced social bees a threat to the endangered Swift Parrot? In 'Proceedings of the Birds Australia Members' Day and Annual General Meeting 2003'. Geography Department, University of Tasmania, 31 May 2003. 18. HINGSTON, A B; MCQUILLAN, P B (1998a) Does the recently introduced bumblebee Bombus terrestris (Apidae) threaten Australian ecosystems? Australian Journal of Ecology 23: 539-549. 19. HINGSTON, A B; MCQUILLAN, P B (1998b) Nectar robbing in Epacris impressa (Epacridaceae) by the recently introduced bumblebee Bombus terrestris (Apidae) in Tasmania. The Victorian Naturalist 115: 116-119. 20. HINGSTON, A B; MCQUILLAN, P B (1999) Displacement of Tasmanian native megachilid bees by the recently introduced bumblebee Bombus terrestris (Linaeus, 1758) (Hymenoptera: Apidae) Australian Journal of Zoology 47: 59-65. 21. HINGSTON, A B; MARSDEN-SMEDLEY, J; DRISCOLL, D A; CORBETT, S; FENTON, J; ANDERSON, R; PLOWMAN, C; MOWLING, F; JENKIN, M; MATSUI, K; BONHAM, K J; ILOWSKI, M; MCQUILLAN, P B; YAXLEY, B; REID, T; STOREY, D; POOLE, L; MALLICK, S A; FITZGERALD, N; KIRKPATRICK, J B; FEBEY, J; HARWOOD, A G; MICHAELS, K F; RUSSELL, M J; BLACK, P G; EMMERSON, L; VISOIU, M; MORGAN, J; BREEN, S; GATES, S; BANTICH, M N; DESMARCHELIER, J M (2002) Extent of invasion of Tasmanian native vegetation by the exotic bumblebee Bombus terrestris (Apoidea: Apidae). Austral Ecology 27: 162-172. 22. HINGSTON, A B; HERRMANN, W; JORDAN, G J (2006). Reproductive success of a colony of the introduced bumblebee Bombus terrestris (L.) (Hymenoptera: Apidae) in a Tasmanian National Park. Australian Journal of Entomology 45, 137-141. 23. KOCHUYT, A M; VAN HOEYVELD, E; STEVENS, E A M (1993) Occupational allergy to bumble bee venom. Clinical and Experimental Allergy 23: 190-195. 29. PERRINS, J; FITTER, A; WILLIAMSON, M (1993) Population biology and rates of invasion of three introduced Impatiens species in the British Isles. Journal of Biogeography 20, 33-44. 30. PYKE, G H; RECHER, H F; O'CONNOR, P J (1989) Patterns of residency and movement among honeyeaters in heathland near Sydney. Emu 89, 30-39. 31. PYSEK, P; PRACH, K (1995) Invasion dynamics of Impatiens glandulifera - a century of spreading reconstructed. Biological Conservation 74, 41-48. 32. SCHMID-HEMPEL, P; SCHMID-HEMPEL, R; BRUNNER, PC; SEEMAN, OD; ALLEN, GR (2007) Invasion success of the bumblebee, Bombus terrestris, despite a drastic genetic bottleneck. Heredity 99, 414-422. 33. SEMMENS, T D; TRUNER, E; BUTTERMORE, R (1993) Bombus terrestris (L.) (Hymenoptera: Apidae) now established in Tasmania. Journal of the Australian Entomological Society 32: 346. 34. SOWIG, P (1989) Effects of flowering plant's patch size on species composition of pollinator communities, foraging strategies, and resource partitioning in bumblebees (Hymenoptera: Apidae). Oecologia 78, 550-558. 35. STERN, A; WUTHRICH, B; MULLNER, G (2000) Successful treatment of occupational allergy to bumblebee venom after failure with honeybee venom extract. Allergy 55: 88-91. 36. USHER, M B (1986) Invasibility and wildlife conservation: invasive species on nature reserves. Philosophical Transactions of the Royal Society of London B 314, 695-710.